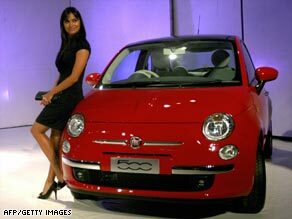 Fiat's update of the Cinquecento. The company says its small car expertise can help GM Europe get back on track. If successful, the new company would become one of the largest car manufacturers in the world behind Toyota. The combined company would generate about $100 billion annually with sales of between 6 and 7 million cars a year. "Clearly they're trying to take advantage of the opportunity when a lot of stakeholders may be willing to accommodate them," said John Bonnell, an auto industry analyst with JD Power and Associates. "It may be their only opportunity to get to the kind of scale necessary to succeed in this market." To secure the deal, Fiat is hoping to secure loans from the German government, raising concerns in Germany about helping to fund the Chrysler deal. The company plans to keep its plants operating in Germany, but will reduce workforce, which is likely to raise political concerns.